This fiery Szechuan recipe is quite popular in South East Asia and can be prepared quite easily. There are few different versions of the original recipe so I've altered it a bit to match my taste preferences. 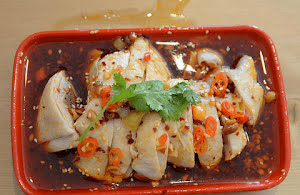 Generally, it is prepared with chicken breast but you can use chicken leg drumsticks as a whole too. Though I've kept the breast pieces as it is, you can shred them to allow the spicy sauce to penetrate deeper into the meat. And, do not hesitate in moderating the spice quotient as per your taste. If you do not prefer chicken dipped in the fiery sauce base, you can instead go for a drizzle of the same just before serving. So, here we go to make this hot chicken preparation which's going to liven up your taste buds, instantly. Savor this spicy and hot chicken preparation which is flavored with an extremely aromatic and flavorful sauce base giving it a divine taste and texture. Apply ground pepper and kosher salt on chicken pieces and keep aside for 5 minutes. Add chicken stock in a large nonstick pan and put it on a medium flame. When it starts simmering, add chicken pieces with minced garlic, minced ginger, chopped scallions and Chinese cooking wine. Close the lid and simmer for about 12 to 15 minutes. Remove pieces from the flavorful stock and put the pan back on the burner. Switch the flame to low and add ground dried red chili, Chinese five spice powder, cornstarch, Chinese chili oil, sesame oil, dark soy sauce and sugar. Simmer for about 3 to 4 minutes until the fiery sauce thickens. Take a large serving bowl and pour all the sauce base in it. Dip all the chicken pieces in it. Garnish with sesame seeds, fresh chopped red chili and cilantro sprigs.